by marc / Friday, 25 January 2019 / Blog Category: Downtown - Old Vegas and Everything Vegas. In conjunction with the Downtown Grand’s five-year anniversary, the company recently announced an expansion. The hotel-casino will be adding a new hotel tower. The expansion will increase the footprint of its hospitality space by over 250,000 square feet. Construction on the new tower should be open by mid-2020. The third hotel tower at Downtown Grand will be feature seven guest-room floors. The new building will add 495 new rooms to the property’s existing 629 hotel rooms that are currently spread out in two towers. The new hotel tower will make Downtown Grand one of the largest hotels in downtown Las Vegas. All together the three towers at Downtown Grand will have 1124 hotel rooms. The Downtown Grand’s third tower will be located on the east side of the property and flanked by Stewart and Ogden. If you visited Downtown Grand in the early days, you might remember that the restaurant known as Freedom Beat used to be named Stewart + Ogden. The new tower will add two new features for the Downtown Grand. The property will have increased street-level presence and a new entrance to the hotel’s casino floor. Downtown Grand currently offers a limited number of suites. The current offerings include one-bedroom, city, grand, and bunk bed suites. The one-bedroom suites start at $95 if you’re looking for a slightly larger hotel room in downtown Las Vegas. “We are advancing our progressive growth plan for the Downtown Grand development as the demand for our rooms have steadily increased since our opening, and our guests continue to share their positive experiences about the Hotel, Casino, and restaurants. 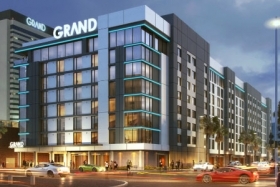 We believe that having over 1000 rooms will allow us to meet that new demand and provide a Downtown Las Vegas experience visitors as well as locals are seeking,” said Kevin Glass, General Manager of Downtown Grand Hotel & Casino. Downtown Grand is more than just its own hotel-casino. The property and its partners encompass an entire block which includes the hotel, casino, along with outside drinking and dining amenities. Across the street, guests can visit Triple George Grill, Pizza Rock, and Hogs & Heifers Saloon.